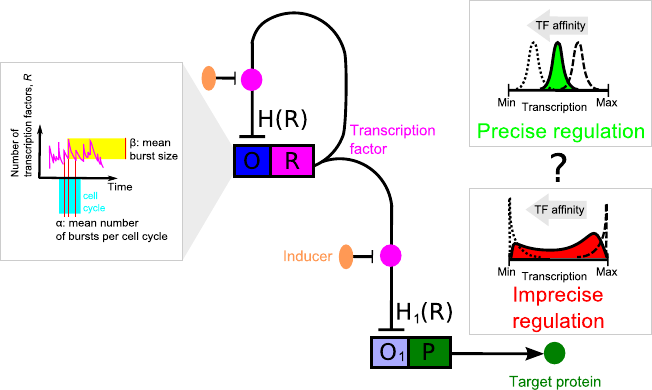 In [A. Ochab-Marcinek, M. Tabaka, PNAS, 2010] we studied a theoretical model of gene expression in the simplest possible gene regulatory system: a two-step cascade with noncooperative binding of transcription factors. Such a system is deterministically monostable. We have shown that in this system bimodal gene expression is still possible: The reaction of binding of transcription factors to DNA acts as a nonlinear noise filter that transforms the unimodal distribution of transcription factors over the cell population into the bimodal distribution of proteins produced from the regulated gene. We have found a simple method based on geometric construction that allows one to predict the onset of bimodality. These findings may explain the experimentally observed bimodal response of cascades controlled by the tetracycline repressor. In this project, we extended our study to more complex regulatory motifs. We wanted to find the conditions for precise gene regulation in these systems.